If ever there was a doubt before, the statistics [1, 2] below just don’t lie; we’re clearly in the wireless age. This year, the number of cell phones on the planet will outnumber people. The average age for the first cell phone is now 13 years old. Mobile web adoption is growing 8 times faster than web adoption did in the 1990s and 2000s. There are over 1.2 billion (yes, with a ‘b’) people accessing the web from their mobile devices. People spend an average of 1.8 hours per day on their mobile devices. These statistics are readily available on Google; statistics that seem to be harder to track down, however, is what these devices take to be able to remain connected to the enormous network built to support them. Coverage is better today than ever before, and you may have seen advertisements like the one below exploiting this fact. “Which map would you choose?” as the advertisement says. Research is building that you might want to choose the map on the right, or the parts of Western Alaska on the left. 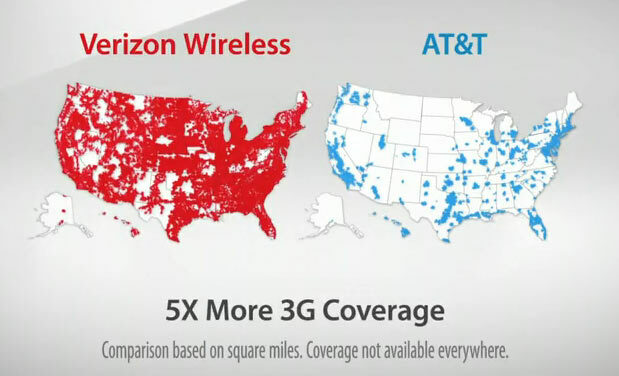 By definition, if we have wireless coverage, we have RF radiation, because they’re one in the same. This massive infrastructure designed by the major cell phone carriers has effectively placed the entire United States under a blanket of RF radiation “coverage” or “service.” Our cell phones connect, but what exactly is that blast of RF radiation from the two-hundred foot tall tower in your neighborhood, and what happens when you live for years in its coverage area? Among this increasing research is a study about the health effects on children across all ages. Pediatric occupational therapist Cris Rowan lists 10 adverse health effects attributed to handheld devices when used by children through their varying developmental stages. The article can be found here: http://www.huffingtonpost.com/cris-rowan/10-reasons-why-handheld-devices-should-be-banned_b_4899218.html. Rowan’s item number 9 discusses a recent change in classification by the World Health Organization (WHO) of cell phones and other wireless devices as a category 2B risk (possible carcinogen) due to radiation emission. Considering the growth and development of children’s brains and other critical neurological systems, this classification is an extremely important to be attentive toward. Further to this case, Rowan’s article goes on to detail Dr. Anthony Miller from the University of Toronto’s School of Public Health’s disposition that this classification is still not enough; that instead, RF radiation should be considered a Class 2A, a probable carcinogen. Finally, the American Academy of Pediatrics has also taken notice of the conversation, and has filed for additional review of EMF radiation emission http://apps.fcc.gov/ecfs/document/view?id=7520941318. What is a probable carcinogen? Cigarette smoke contains several class 2A carcinogens, and in this day and age, we are well aware of their effects. In fact, the association with cigarettes and cancer has become so significant that labels are now required on the packaging of cigarettes. Will we one day see the same appearance on a cell phone? Once upon a time, doctors encouraged women to smoke cigarettes to relieve stresses onset by pregnancy. Today, we find the advice so preposterous that it’s comical. It’s important to remember that the advice is only ridiculous because of the side of history in which we reside; much information has been brought to light over many years. As research continues to build the case outlining the dangers associated with RF use, we must consider the way of the cigarette: do we simply live on the side of history that is unknowledgeable? If so, we’re no different than pregnant women smoking cigarettes… ignorant to the realities that lie beneath the surface. RF is colorless, odorless, and massless, but its effects are documented. This discussion is neither new, nor limited to the United States. Back in 2006, Swedish researchers published results to a study found in the International Archives of Occupational and Environmental Health which correlated a 240 percent increased risk of malignant tumors on the side of the head where the phone is routinely used. This study was performed on “heavy users” of cell phones, which is defined as users talking on their phones for 1 hour per day, every day, for nearly six years. This is not out of the question for many regular phone users, and also only takes into account the brain effects during transmission, not the impacts of a cell phone in the pocket transmitting simple data tasks like email and text messages. Global phone sales reached 418 million units in 2013. American wireless customers, according to Verizon, extends beyond 290 million users, paying for plans on a monthly basis. Given the number of dollars wrapped up in this industry, do not be surprised if the topic of cell phone radiation and the research surrounding the effects of RF radiation don’t make it to your nightly news. Legislation banning this technology would be devastating to the industry. Think twice about your technology and what it might be doing to you. They’re convenient, they’re fun, and they help us accomplish so much in an otherwise chaotically paced world, but don’t ignore the dangers.